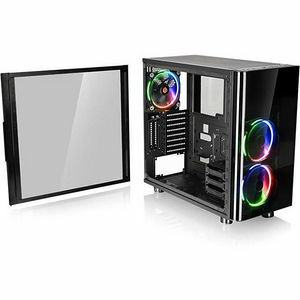 The View 31 Tempered Glass RGB Edition mid tower chassis features dual durable 4mm thick tempered glass window, riser GPU support bracket with optional PCI-e riser cable, and three preinstalled patented 140mm Riing RGB LED fans, which give users the option of 256 color selections while ensuring outstanding cooling performance. The View 31 TG RGB supports the latest PC hardware and all high-end GPU solutions, guarantees on unparalleled expandability for high-end configurations and liquid cooling system to satisfy the market where users have opted for stylish PC chassis with advanced features and aesthetic appeal. The View 31 TG RGB comes with fully modular drive cages that provide the ease of installation/removal and maximize the interior space for custom cooling loop. Especially, the tool-less drive bay design allows users to freely interchange the 3.5" and 2.5" hard-drives to suit their particular needs. Specially designed with dual GPU placement, the View 31 TG RGB has the support for vertical graphic card layout with dual PCI-E slots design. The PCI-e riser cable is optional. Plus, the included riser GPU support bracket not only can prevent the graphic card from sagging, but also helps to reduce the weight on the motherboard. Thermaltake PCI-e X16 Riser Cable (Optional) - Support a wide range of GPU solutions. The View 31 TG RGB features its cable management with maximum 50mm in width, and supports up to a tower CPU cooler with maximum height 180mm, and a dual expansion slot VGA of up to 420mm in length without HDD rack. Moreover, the View 31 TG RGB has the ability to accommodate multiple 3.5"/2.5" storage devices at the same time. Most importantly, the hidden drive bay design guarantees expandability for more liquid cooling components.